The global ileostomy market is highly consolidated in nature with a few players holding a major share of the market, states a new research report by Transparency Market Research. In 2016, the leading players in the market, namely Hollister, Coloplast, and Convatec led the global market in the last few years by holding a share of more than 36%. These players are focusing on development of new product to maintain their market position. In addition, the increasing number of mergers and acquisitions and collaborations are estimated to enhance the growth of the overall market and generate promising growth opportunities for the key players operating in it across the globe. Furthermore, technological advancements and innovations are likely to enhance the market growth in the near future. The new entrants of the market are focusing on research and development activities to attract new customers. 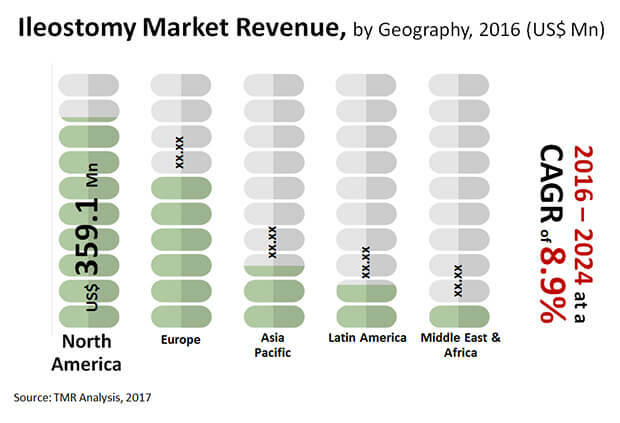 According to the research report by Transparency Market Research, in 2015, the global market for ileostomy was worth US$765.2 mn and is estimated to reach value of US$1.65 bn by the end of 2024. The market is likely to register a progressive 8.90% CAGR between 2016 and 2024. Among the key regional segments, Europe is estimated to lead the global ileostomy market holding a large share throughout the forecast period. In 2015, this region held a share of 43.2% of the global market and is expected to remain in the leading position. The well-developed healthcare infrastructure and the rising awareness among consumers regarding ileostomy are some of the key factors that are likely to encourage the growth of the Europe market throughout the forecast period. In addition to this, the presence of several leading players in this region and the favorable government policies are estimated to accelerate the growth of the market in the near future. On the other hand, Asia Pacific is projected to witness high growth throughout the forecast period. On the basis of procedure, the global market for ileostomy has been classified into loop ileostomy and end ileostomy. Among these two segments, the end ileostomy is estimated to witness high growth throughout the forecast period. As per the research study, this segment is likely to retain in leading position in the next few years and hold a large share of the market. The rapid growth of this segment can be attributed to the increasing demand for ileostomy for the treatment of inflammatory bowel disease. A significant rise in the geriatric population and the development of the healthcare industry are the key factors that are likely to accelerate the growth of the global ileostomy market throughout the forecast period. On the flip side, the rising preference of patients for alternative procedures is estimated to curtail the growth of the overall market in the near future. Nevertheless, the increasing research and development activities and innovations are predicted to generate promising growth opportunities in the near future. Rising geriatric population and increasing number of chronic diseases are encouraging the growth of the global market. Research and development activities to offer potential growth opportunities for market players.